“Where do I start?” is the question I get asked most by attendees of the MarketingSherpa B2B Marketing Summit in San Francisco. Marketing Automation is still very new for many companies, and it’s not immediately obvious how you can get started step-by-step. In this post I listed 8 ideas to address this question (and feel free to share yours in the comments!). If you start doing marketing automation or lead nurturing, first focus on the most attractive subset of your prospects. For example, focus on a particular product or market segment with a high value. SAGE Publications, one of the presenters at the conference, has many business units with different marketing needs. They first focused their marketing automation efforts on academics who pick the text books for their classes, because winning over one teacher could mean selling hundreds of text books. An often made mistake is to nurture too small a database. If your problem is lack of raw leads, first address that problem. Genoo, another presenter, used Social Media to fill their prospect database, primarily leveraging LinkedIn Groups and LinkedIn Answers. What is going to make your boss really happy? Is it more qualified leads, a higher percentage of marketing-sourced opportunities, better ROI on marketing investment, customer loyalty, or something else? Pick the most important one and make sure you deliver. The presentation of Ness Technologies clearly pointed out that the CFO can spend money in many ways: make sure you can justify the CFO’s investment in marketing. Leads go through various stages, from new leads to existing customers. In each stage the follow-up may be different. Find out in which stage marketing can contribute most in the short term. Tom Hayden from SAGE Publications created a flowchart that guided discussions in the entire organization, from the sales teams to the CEO. It was used to gain consensus and set the right priorities. Marketing automation only works if you clean up junk leads, merge all duplicates, normalize company names, and verify all contact information. Additionally, enriching the data with the prospect’s interests makes it possible to better target your campaigns. National Instruments, another presenter at the MarketingSherpa conference, used website behavior to enrich the prospect profile and personalize lead nurturing campaigns. The key ingredient for lead nurturing is high-quality content, not about your solution itself, but about the broader issues that it addresses. Although more content is better, you can already start nurturing with a few pieces of good content. For example, Ness Technologies used 3 well-chosen content assets to run an entire campaign. Improved marketing will drive better-quality leads to sales, but it takes time and trial-and-error to get there. Create some goodwill by giving sales some quick results, for example a tool that alerts them when prospects visit the website. Or give them more background information on prospects: how did they find the website, which pages did they visit, what whitepapers did they download, and so on. Okay, this may sound a little strange, but failure is not a big issue in online marketing. Just recognize it and change course and soon as possible. You can measure results fairly quickly, so use this information to learn as you go. What impressed me about this conference is how well the speakers were selected. In this post I’ve only mentioned a couple of speakers, but all speakers brought up very relevant issues, and creative solutions to common marketing problems. If you’ve missed this conference, you can still attend the B2B Marketing Summit in Boston on October 5 and 6. I’d love to hear your tips to get started with marketing automation: please let me know in the comments. This entry was posted in Demand Generation and tagged b2b summit, content marketing, lead flow, lead nurturing, marketing automation, marketing metrics, marketingsherpa on September 24, 2009 by Jep Castelein. About two weeks ago I posted a survey that asked the LeadSloth readers what they wanted to read about. As it goes with surveys, it took some effort to get people to fill it out. But this week it reached critical mass, so I was able to draw some interesting conclusions. It is interesting to see that ROI and Best Practices score so high. I was surprised to see Landing pages & forms: important, but not very exciting. And the last topic “Social Media” confirmed my gut feeling that Social Media is hotter than Inbound Marketing and Search Marketing (which were hardly mentioned by the respondents). I was surprised to see that the large majority of respondents mentioned Thought Leader Interviews: I clearly need to do more of those. Then both practical but advanced posts and opinion pieces were highly valued: clearly people enjoyed some of the recent posts that had a lot of discussion, like the “7 reasons why marketing automation projects fail” post. Let me know any additional feedback! This entry was posted in Demand Generation and tagged LeadSloth on September 24, 2009 by Jep Castelein. What Should LeadSloth Write About? I’ve been writing this blog for a while now, but I’ve never explicitly asked for your input. The topics have been diverse, and I’d like to focus a little more on what you would like to read about. So please tell me about your preferences! Can you please fill out this questionnaire? If you have any questions, please let me know (jep on leadsloth dot com). This entry was posted in Uncategorized and tagged LeadSloth, survey on September 8, 2009 by Jep Castelein. 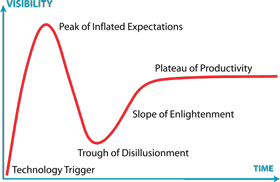 Marketing Automation is on its way to the peak of the hype cycle. People start adopting software because it’s cool, not because they know what to do with it. The result: inflated expectations. However, there are a couple of B2B Marketing experts who understand how to avoid inflated expectations. One of them is Megan Heuer of SiriusDecisions. Together with Craig Rosenberg (aka The Funnelholic) of Tippit she presented a webinar called The 9 Metrics Every Marketer Must Track. This webinar shows how to focus on the correct metrics rather than on gimmicks. My recommendation: use your Marketing Automation project to improve these 9 metrics and you have a good chance of avoiding disillusionment (and pleasing your CEO). Some long-standing VPs of Marketing seem the best marketers of their own performance: by staying vague about results and telling a good story they can hold on to their jobs for quite a while. However, the truly effective VPs of Marketing promote transparency and have an intense focus on improving the few metrics that matter. The strongest metrics show how marketing contributes to bottom-line revenue. The first two focus on the influence of marketing on the sales pipeline, and the last two give an indication of the ROI. Obviously, #4 (investment to revenue) is also dependent on the performance of the sales team (whether they are effective in closing deals). You can watch the webinar to get benchmark figures for these KPIs. An inquiry could be any new lead, also someone who dropped off his business card at a tradeshow, or a download of a whitepaper. An MQL is also called a sales-ready lead. Usually some kind of Lead Scoring is used to determine whether a lead is ready to be passed on to sales. For more details and benchmarks, watch the webinar. The cool thing about these metrics is that you can update them more frequently, so you know immediately whether you are on the right track. This is your Lead Management Thermometer! How Does Marketing Automation Fit Into This? Marketing Automation is a tool. It’s supposed to improve business results. In my previous post, I suggested to look only at increased revenue to measure success of Marketing Automation. These metrics are a great way to see if you’re on track. More practical: how does Marketing Automation influence these metrics? Just some examples: continued lead nurturing turns more inquiries into sales-ready leads; lead scoring shows when leads are sales-ready; lead scoring gives quick feedback on the quality of various lead generation programs. But ultimately, the features of the Marketing Automation are only valuable when they are used well, and improve the above-mentioned metrics. This entry was posted in Demand Generation and tagged key performance indicator, marketing automation, marketing metrics, marketing roi, sales-ready leads, siriusdecisions, tippit on September 3, 2009 by Jep Castelein.